I carried out fieldwork in Eweland between March 1971 and October 1973 with a two-month interruption in April-May 1973. Professor Meyer Fortes my supervisor at Cambridge suggested that I study the northern Ewe. I am immensely grateful to him for this suggestion and for challenging me to understand their social organization. I am also thankful to Professor Jack Goody for his advice and encouragement during my doctoral work. Above all I am forever thankful to the people of Abutia and particularly Kloe where I settled. They patiently and kindly gave their time to answer interminable questionaires and interviews and during the two years that I lived in Kloe they showed a friendliness and understanding that made these two years two of the most pleasant ones in my life. The research was financed by generous grants from the Canada Council and the Quebec Ministry of Education. Their financial support made possible my long stay in the field and ultimately enabled me to collect sufficient data to make some sense of the Abutia social organization. More personally I wish to thank Dza Kwasi and Daniel Doh my closest assistants in Kloe ; their friendship gave me a privileged insight into Kloe life. The unwavering moral and financial support of my brother Jean and his wife Nicole have also helped me find the time necessary to write this monograph. Dr Peter Sutton kindly accepted to copy-edit the manuscript. They but above all my wife Diane to whom this book is dedicated have made this book possible. Parts of this book have already appeared in print. 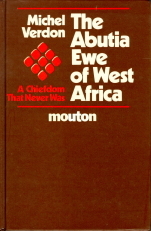 The Abutia political organization has already been examined in some detail in three articles in Africa : "The structure of titled offices among the Abutia Ewe" (49 : 159-71) "Redefining precolonial Ewe polities : the case of Abuda" (50 : 280-92) and "Political sovereignty village reproduction and legends of origin : a comparative hypothesis" (51 : 465-76). In another paper "Sleeping together : the dynamics of residence among the Abutia Ewe" (Journal of Anthropological Research 35 : 401-425) I have presented part of my analysis on residence whereas the study of the Abutia matrionial practices has already been broached in a number of publications : "Agnatic descent and endogamy : a note" (Journal of Anthropological Research 37 : 247-255) "Of mathematics and comparison : Pende and Abutia marriages" (L'Homme 22 : 75-88) "Divorce in Abutia" (Africa 52 (4)) and "Polygyny descent and local fission : a comparative hypothesis" (Journal of Comparative Family Studies forthcoming). The theoretical part of the book as mentioned in the Introduction has been elaborated in greater detail in three main articles : "Shaking off the domestic yoke or the sociological significance of residence" (Comparative Studies in Society and History 22 : 109-32) "Descent : an operational view" (Man (n.s.) 15 : 129-50) and "Kinship marriage and the family : an operational approach" (American Journal of Sociology 86 : 796-818).